2016 Tempe Oktoberfest Website goes LIVE on September 1st!! Don't miss all of the fun-October 7-9, 2016 at Tempe Beach Park!! CLICK HERE for Tempe Oktoberfest Website Information!! 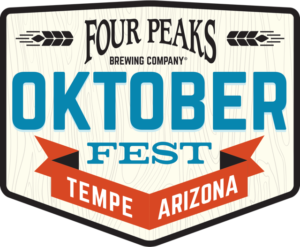 This year brings Four Peaks Brewery’s beer portfolio as well as other German style beers, German style fare like bratwursts with sauerkraut, German potato salad, pretzels, and more! We can’t forget about the other festival favorites like noodles, burgers, chocolate covered fruit and that is only the beginning! Music is one of the biggest parts of the festival and this year’s lineup is NO exception. Whiskey’s Quicker, Jared and the Mill, DJ Munition, Mogollon, and the Das Aubachtal Sextette to name just a few! The Four Peaks Oktoberfest welcomes Grammy Award winning artist Lil Jon to take the stage and close out our Friday night festivities. Want to find out who is closing out Saturday night? Check back when our website goes LIVE on September 1st. Don’t want to miss the BIG game?! Come to our Kilt Lifter Sports Haus to enjoy a cold beer (or two) at a great outdoor sports bar built exclusively for the Four Peaks Oktoberfest! We will have something for the entire family including the Landings Credit Union Kinderfest filled with games and fun activities for kids and adults young at heart. We also have the world’s largest…nah…we can’t give away all of the details just yet… CLICK HERE as our new site goes live September 1st and will be chalked full of information, details and snazzy new look!